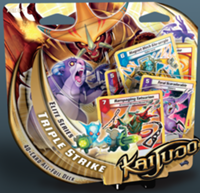 Kaijudo has been out for a year now! As part of the celebration, Wizards has put out a brand new deck called “Triple Strike”. More than just another battle deck, this is a forty card foil deck featuring a gaggle of rare cards and three exclusive cards. 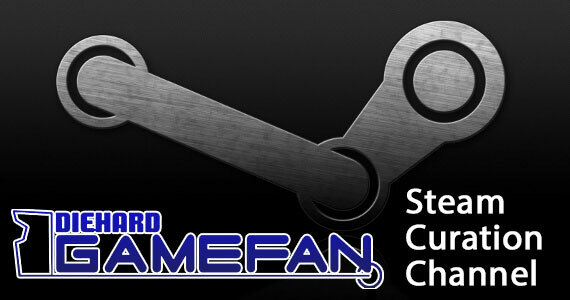 Fans of the game are going to love the rares and exclusives, while fans of the show aren’t left out either. Each of the three exclusives represent a companion of the show’s main characters. That’s right, we get more cards for Gargle, Bob, and Squeaky! Anyways, I started drooling at the mouth when I saw the card list, so let’s check it out! First up, we’ve got the exclusives. Representing the fire civilization is Rampaging Tatsurion. He’s got to be at least the tenth version of Tatsurion released so far, which is nuts. He’s certainly not a bad card at all. A level seven with eight thousand attack and double breaker is nothing to sneeze at. His Aftershock Shells ability is killer though. When he defeats a creature in battle, he’s allowed to banish another enemy creature with power less than the first creature. Opponents will have to block at their own risk, as this card could easily clear the board in a turn or two. From water, there’s Magnet Mech Glu-urrgle. A level six with six thousand attack and the double breaker, he’s a decent powerhouse in his own right. 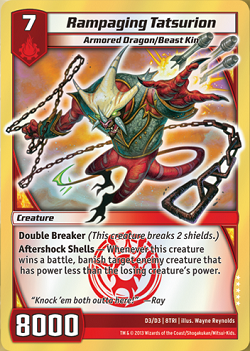 If your opponent fails to block him, he can bounce back up to a level five creature for free! I can attest to the usefulness of this ability. I played against my brother, and had no shields left. Thanks to this card, I was able to banish one of his creatures, and bounce back the other, saving me the game and allowing me time to make the comeback. This is probably the second best version of the character so far, because nothing beats the Hovercraft. Finally, we have Feral Scaradorable from the darkness civilization. Sadly, she doesn’t have double breaker, but is far from just five thousand attack at level five. The Mindshred ability is awesome. If Squeaky breaks a shield, your opponent must mil the top card of his/her deck. If that card was a spell, you get to banish a creature. 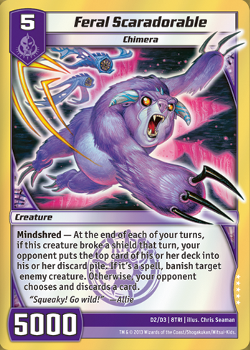 If that card was a creature, you force them to discard a card, maybe even the one they just got from the shield pool. Either way, breaking a shield with this monster is definitely worth it. As if these three exclusives weren’t enough, you’ll find a copy of Razorkinder in the deck as well. Razorkinder is a fun card that banishes an untapped creature when it comes into play. 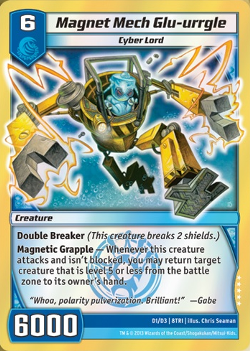 Previously, this card was only available in the original Battle Decks that introduced the game. This is a great way to honor the game’s anniversary. I’m pretty stoked about having another one of them to be sure. Triple Strike is a three color deck featuring fire, darkness, and water. It’s actually a control deck of sorts. For those unfamiliar with the term, a control deck focuses on limiting your opponent until you pull out one or two game winning creatures late in the game. It works best by playing spells that get rid of pesky creatures and put cards into your hand. There’s a definite pattern here in terms of what each civilization adds to the deck. The water civilization doesn’t offer much power beyond Glu-urrgle, but it is great at support. Reef-Eye and Fluorogill Manta are low level blockers that will hold your opponent at bay early on. Aqua Seneschal is good for drawing cards every turn (any good blue deck has three of them), as is Logos Scan. Crystal Memory is a great card, as it allows you to search for any card in your deck and put it into your hand. Also available for use is Bottle of Wishes, which I previewed earlier this year. These last two have shield blast, which make them a great answer to an early onslaught. Darkness, like water, isn’t about offering up lots of power. In fact, Scaradorable is the strongest darkness creature in the deck by a long shot. However, darkness makes up for this by offering three Dream Pirates for defenders that can attack. Also, darkness offers up several ways to banish enemy creatures. Bone Blades is a tried and true method, as is Terror Pit. Both are shield blasts, which is just dandy. Razorkinder is a great play as a response to a big play by your opponent. This deck will be banishing lots of creatures, and Black Feather of Shadow Abyss is great for drawing a card every time that happens. If you get enough mana, you can also play a late game Soul Shatter to empty your opponent’s hand. As you may have guessed, the true brawn of the deck resides in the fire civilization. Early on, cards like Comet Missile, Rock Bite, Tornado Flame, and Meteosaur aid in clearing out enemy creatures. Late in the game, it’s all about the dragons. Tatsurion is a great choice, but the deck also has Moorna and Bolshack to contend with. Any of these three creatures is capable of winning you the game. Best of all, the deck also includes a Hyperspeed Dragon, which gives the fast attack ability to any dragons you play afterward. While it is certainly possible to win the game without the dragons, they sure are fun to play. If you want my overall opinion on the competitiveness of the deck, I have mixed feelings. There are a lot of expensive cards in the deck, and a bad draw could leave you defenseless. Every game I played, the deck started off real slow, and I found myself losing shields on purpose to try and get lucky. While some control decks work like that, it can be unnerving. However, this deck is great at making dramatic turnarounds, as there are just so many cards that take out enemies. 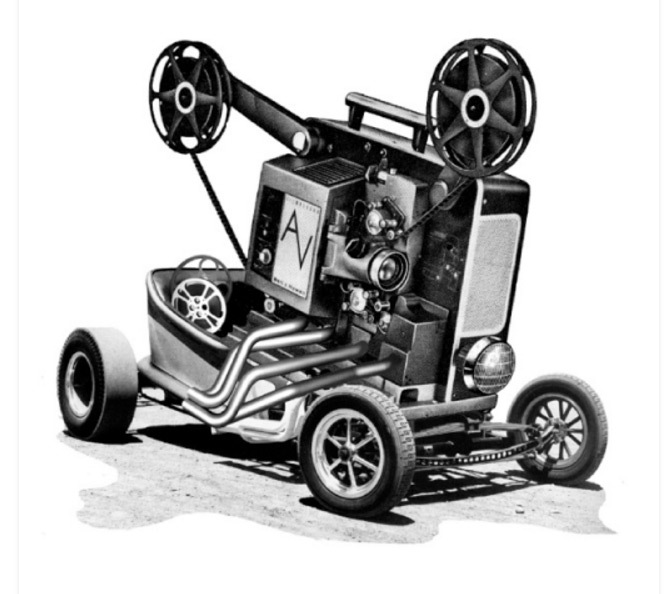 It could certainly use some tweaking though. I think a few more low level blockers, or at least different ones, could make a good difference. Skeeter Swarmer would be a good choice. I’d also probably trade out one Meteosaur for another Tornado Flame. Of course, I’m not sure I’ll edit this deck at all, as I’d like to keep all of the foils together. If you don’t have qualms about taking the deck apart and using the cards in other decks, then this deck is a must buy for sure. It is chock full of rare cards. Nearly half the deck is rares, and there are a lot of darn good ones in here. Terror Pit, Bottle of Wishes, Skull Shatter, Crystal Memory, and others are great cards that fit in a number of good decks. The three exclusives, plus the bonus Razorkinder, also make this hard to pass up. The deck goes on sale this Friday, and retails for about twenty bucks. For serious fans of the game, this is a must buy for sure. The cards offered up are just too good, and the deck idea has enough merit to use by itself. I really hope WotC plans on putting out more of these.